Visit Indressme.com and leave your comment below that which product you like the most. 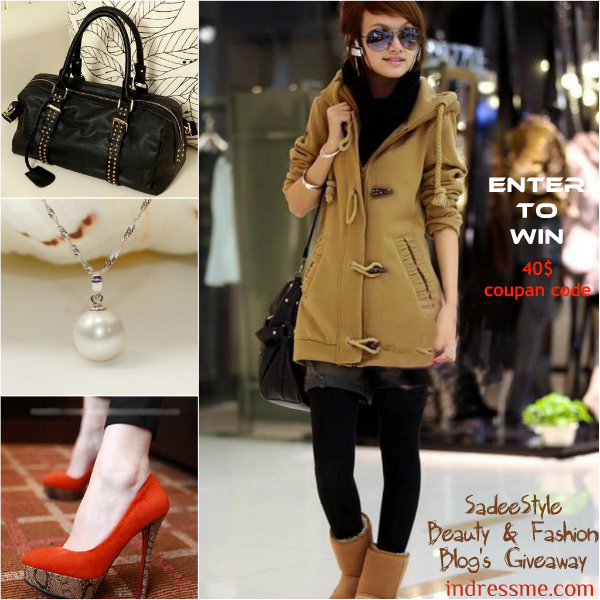 1) Visited Indressme.com , i like this bag ..
6) Update Facebook status about this Giveaway. I like the Black Personality Hole Slim Stretch Women's Jeans. 2. I liked the Indressme Latest Street Fashion Collection on Facebook. I like the Colorful Stripe All-Match Long Sleeve Round Neck Hollow Casual Sweater. I Follow Blog Publicly via GFC: SadeeStyle Beauty & Fashion Blog as nightowl. #1 Iike SadeeStyle on Facebook . #2 I Iike SadeeStyle on Facebook . - FB: Nuria Gar. Bue. (I prefer don't put my surname here). - FB: Nuria Gar. Bue. Aww so sad to hear this from you i had a good shopping experience with them so i would suggest you to shop from Romwe they have the best customer service ever!